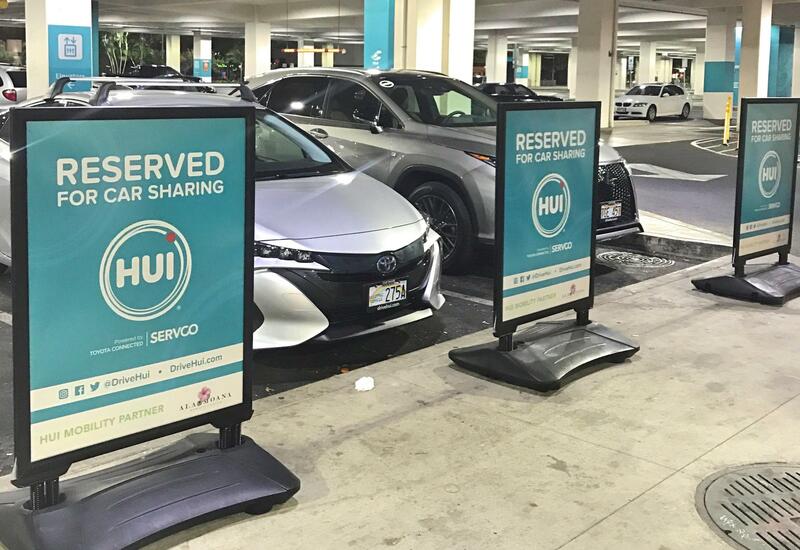 The Hui Car Share Station at the Ala Moana Shopping Center is one of 25 stations across the city where drivers can utilize Hawai'i's latest car share service. After several months of test driving,Servco Pacific and Toyota Connect launchedHui Car Shareyesterday at 25 locations throughouturban Honolulu. 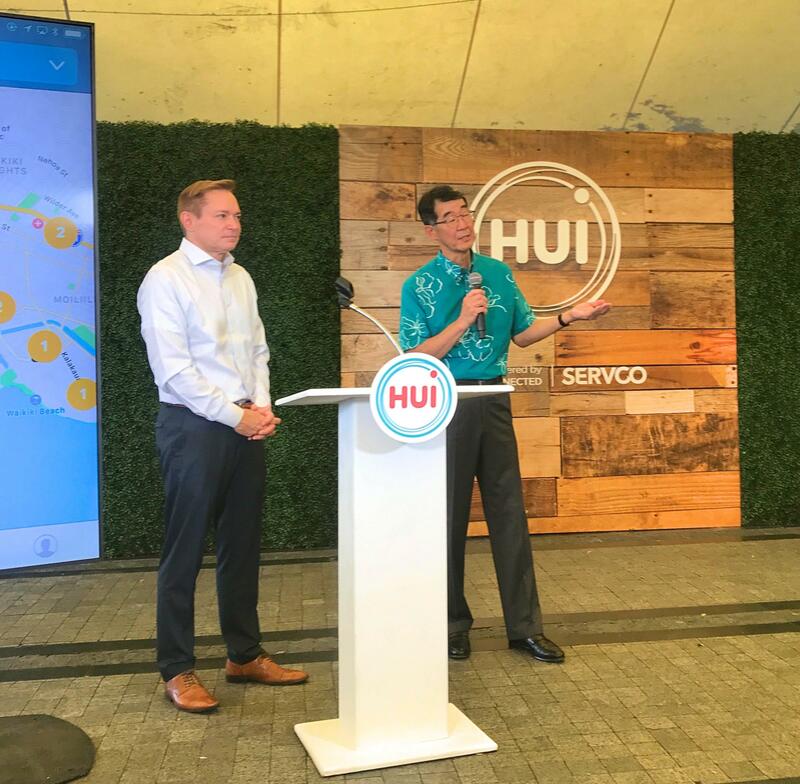 Servco Pacific's President & CEO Mark Fukunaga (right) announces the launch of Hui Car Share in partnership with Toyota Connect North America (TCNA). Zach Hicks (left) is the President & CEO of TCNA. Users can choose from a fleet of 70 Toyota and Lexus vehicles, including the Prius, Camry, and Lexus RX – all accessible by smart phone. Hui Director Peter Fukunaga demonstrates. 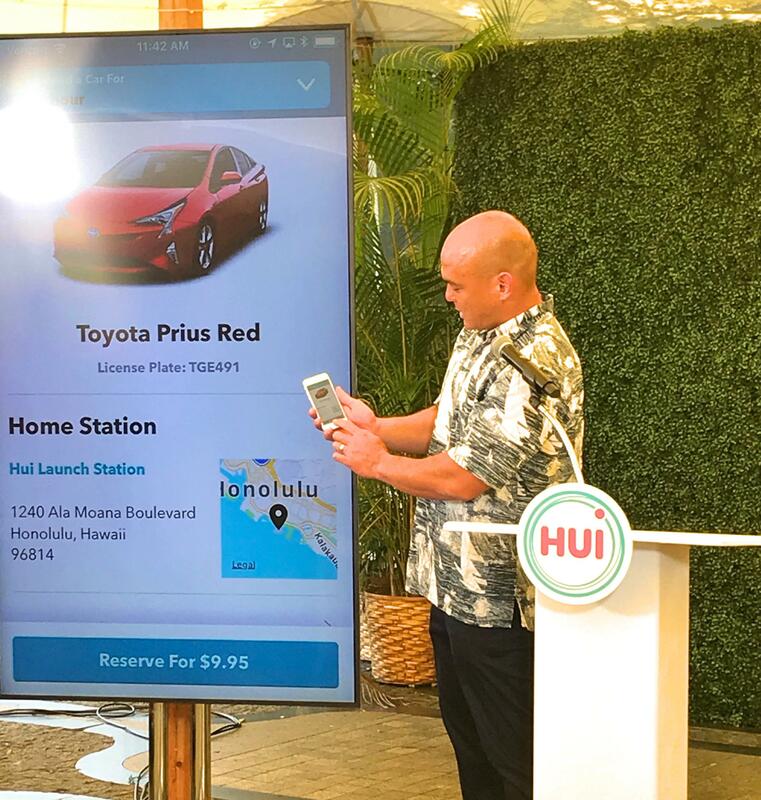 Peter Fukunaga, Director of Hui, demonstrates the car share service's mobile app technology. Cost savings and convenience are also big drivers of car sharing in Hawai’i. According to the American Automobile Association (AAA), owning and operating a vehicle in the United States costs nearly $8,500 a year – a figure that is likely higher in Hawai’i given the local price of gas. “Why pay 100 percent for the car when you use it 5 percent of the time?” says Mark Fukunaga. Drivers can rent a Hui car for $9.95 an hour or $79.95 for the day. The cost includes gas, insurance, and roadside assistance. A Hui Car Share Station at Ward Village. But there are challenges says Aki Marceau, policy director at Elemental Excelerator and chair of the Sustainable Transportation Coalition of Hawai’i. A Honolulu city ordinance prevents the use of street parking for commercial entities. Instead, Hui worked with private land owners and parking lot operators to house their fleet. Marceau says car share company Car2Go pulled out of Hawaiʻi back in 2015 because of this issue. “And I think that’s a huge opportunity for both (Honolulu) City Council as well as the City & County of Honolulu, as well as the state at-large to really think holistically about how we want to prioritize our parking spaces on the road to enhance car sharing opportunities,” says Marceau. Today, there are more than two dozen companies competing for business in a car sharing industry that has been around for about 15 years. Advocates say increased concern over the environment and decreased popularity of car ownership among millennials may spur industry growth.